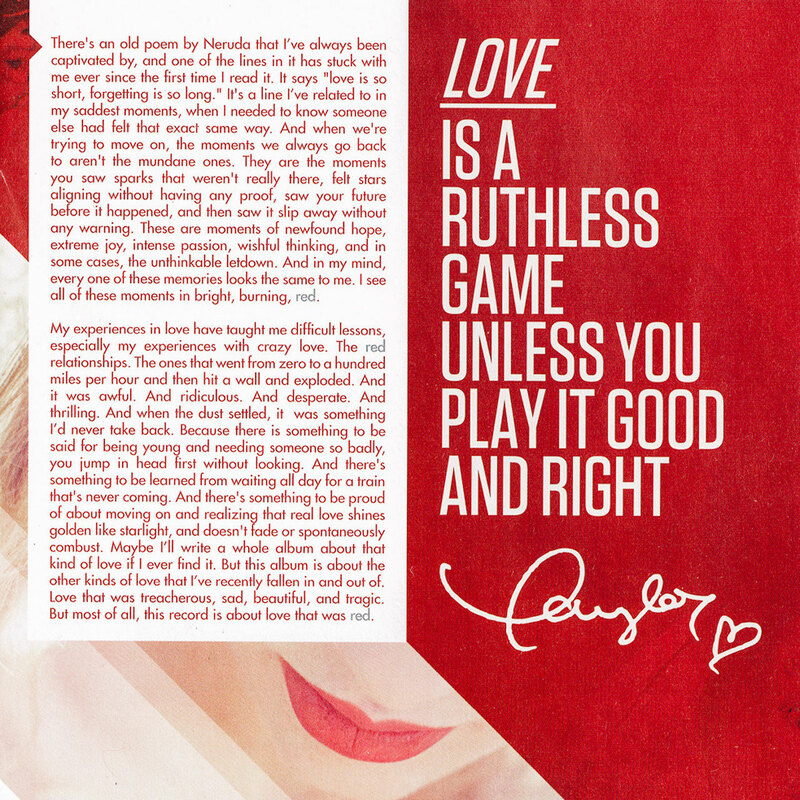 Love is a ruthless game unless you play it good and right. There's an old poem by Neruda that I've always been captivated by, and one of the lines in it has stuck with me ever since the first time I read it. It says "love is so short, forgetting is so long." It's a line I've related to in my saddest moments, when I needed to know someone else had felt that exact same way. And when we're trying to move on the moments we always go back to aren't the mundane ones. They are the moments you saw sparks that weren't really there, felt stars aligning without having any proof, saw your future before it happened, and then saw it slip away without any warning. These are moments of newfound hope, extreme joy, intense passion, wishful thinking, and in some cases, the unthinkable letdown. And in my mind, every one of these memories looks the same to me. I see all of these moments in bright, burning red. My experiences in love have taught me difficult lessons, especially my experiences with crazy love. The red relationships. The ones that went from zero to a hundred miles per hour and then hit a wall and exploded. And it was awful. And ridiculous. And desperate. And thrilling. And when the dust settled, it was something I’d never take back. Because there is something to be said for being young and needing someone so badly, you jump in head first without looking. And there's something to be learned from waiting all day for a train that's never coming. And there's something to be proud of about moving on and realizing that real love shines golden like starlight, and doesn't fade or spontaneously combust. Maybe I’ll write a whole album about that kind of love if I ever find it. But this album is about the other kinds of love that I’ve recently fallen in and out of. Love that was treacherous, sad, beautiful, and tragic. But most of all, this record is about love that was red. 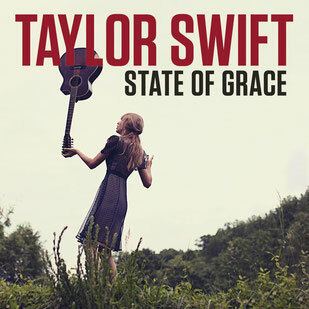 The album opener “State of Grace”, a big-time, grown-up rock anthem, feels like something of a game-changer for Taylor. According to her, the song serves as both the introduction and the conclusion of this album. Throughout the song we see Taylor detailing the beginning of a love with all it’s possibilities and there is an utterly romantic sentiment and charm about the uncertainty and expectations that come along with any new beginning. Musically, the song is a departure from Taylor's then typical country pop, using influences of alternative rock whilst being compared to bands such as U2, Muse and The Cranberries. The song has received acclaim from music critics, who have praised its broader sound in comparison with Taylor's previous material. "State of Grace" was released as the fourth and final promotional single off the album, and was the only promotional single on "RED" that wasn’t re-issued as an official single. 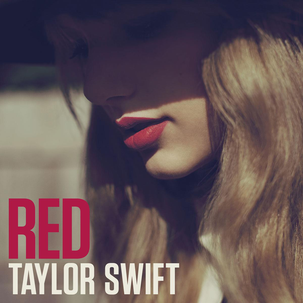 "Red", the title track of the album, compares the emotions Taylor felt in a relationship to colors. Taylor said that she decided to name this song as her album title, as its lyrics encompass the entire theme of the project. "Red" served as the album's fifth single on June 21, 2013. It was part of the tracks released during the four weeks preceding the release of the album and debuted at number six on the US Billboard 100 and at number one on the Hot Digital Songs chart. It also debuted at number two on the Hot Country Songs chart, behind Taylor's previous single "We Are Never Ever Getting Back Together". A music video for the song was released on July 3, 2013. It features footage fromTaylor's "RED Tour". Crowd cheers in the concert can be heard in the background as well. In the song "Treacherous", Taylor uses the word to describe a relationship that might not be the best one for her. As something that is harmful and possibly deceptive. "I Knew You Were Trouble" received generally positive reviews from music critics, who commended its mainstream appeal yet noted Swift's experimentation with dubstep as relatively limited. "I didn’t even know that that’s really what we were doing with the track," she said. "I just knew I wanted it to sound a certain way. And that’s what people have been calling it." At the inaugural YouTube Music Awards in 2013, the music video for "I Knew You Were Trouble" won the award for "YouTube Phenomenon". It also won "Best Female Video" at the MTV VMA Awards 2013. “All Too Well” finds Taylor reminiscing on the memories of a past relationship from start to finish. It is generally looked at as Taylor's best song to date -- by both critics and fans, as well as Taylor herself. It was the first song that Taylor wrote for "RED". The heart-wrenching break-up tune came after a six-month writing block that followed a particularly painful ending of a relationship. "There's a kind of bad that gets so overpowering you can't even write about it," she told USA Today of that time. With the help of her trusted co-writer Liz Rose, Taylor was eventually able to consolidate her feelings into an album-friendly track. "When we wrote the song, I hadn’t heard from her in a while. She hadn’t really been writing. I was in Nashville one day, slowly moving the last bits of junk out of my garage so I could move to Dallas. […] I was in my driveway and my phone rings, and it’s Taylor saying, ‘Man, I’ve got this thing and I really need you to help me with it. Can you write today? What are you doing today?’ [I later] drove over to Taylor’s. It was the first song she wrote for that record, I think. She had a story and she wanted to say something specific. She had a lot of information. I just let her go. She already had a melody and she started singing some words, and I started writing things down, saying, ‘Ok, let’s use this, let’s use that.’ She mentioned a plaid shirt, and I wrote that down in a corner, and when we got to the end, I said, ‘Let’s put the plaid shirt in there.’ That turned into one of the best lines. […] It was the most emotional, in-depth song we’ve ever written. The song has received rave reviews from music critics, with many agreeing it was the best song on the album. Slant Magazine particularly lauded the song within its review, saying “"All Too Well” is arguably the finest song in Taylor’s entire catalogue. "22" finds Taylor celebrating her early twenties by having fun with her friends. It is a bubblegum pop song that has received positive reviews from music critics, complimenting Taylor's collaboration with Max Martin and Shellback and the new pop sound they created for her. 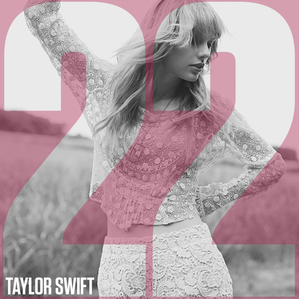 The song was written when Taylor celebrated her 22nd birthday. The hidden message in the album booklet is “Ashley, Dianna, Claire, Selena”. These are the four names of some of her friends. The song is however not only about the birthday celebrations but tells the coming-of-age story where Taylor is changing from a teen to an adult. It tells of the confusing times of being in your 20s where you are “happy, free, confused and lonely at the same time”. The song peaked at #20 on the Billboard Hot 100, becoming the sixth single from "RED" to hit the top 20. Since its release, the song has also found a place in pop culture. It's become a tradition to play the song on your 22nd birthday -- no matter if you're a fan of Taylor Swift or not. “I Almost Do,” is a song that describes the internal conflict that goes on when reminiscing about a romance. 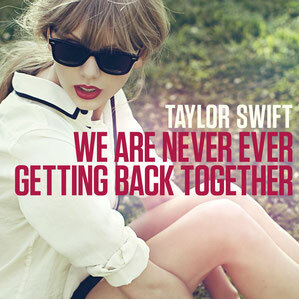 The lead single "We Are Never Ever Getting Back Together" is a bubblegum country pop song; its lyrics depict Taylor's frustrations at an ex-lover who wants to rekindle their relationship. The song was an instant commercial success, becoming Taylor's first #1 on the Billboard Hot 100. Rolling Stone named the song the second best song of 2012 while it took the fourth spot in TIME's end-of-year poll. A music video for the song was released in August 2012. It was the first music video to be presented in 4K resolution and received positive reviews from critics. "We Are Never Ever Getting Back Together" received a GRAMMY Award nomination for "Record of the Year". "Stay Stay Stay" is song where Taylor is imagining what a perfect relationship would be. She wishes this perfect man she has imagined would stay, because she longs for true love. "Stay Stay Stay" was written by Taylor, while the production was handled by her and Nathan Chapman. It heavily uses elements of country pop. The lyrical content finds Taylor asking her lover to stay with her, and comparing him to her exes, whom she called "indulgent takers". It's a very cute, upbeat and catchy song which is innocent and beautiful simultaneously. "The song ‘Stay Stay Stay’ is a song that I wrote based on what I’ve seen of real relationships, where it’s not perfect, there are moments where you’re just so sick of that person, you get into a stupid fight. It’s still worth it to stay in it. There’s something about it that you can’t live without. In the bridge it says, ‘I’d like to hang out with you for my whole life’ and I think that’s what probably the key to finding the one, you just want to hang out with them forever." "The Last Time" tells the story of a long-standing but crumbling relationship. It ties into the theme of what happens throughout a relationship similar to one in songs like “I Almost Do” or “We Are Never Ever Ever Getting Back Together”. 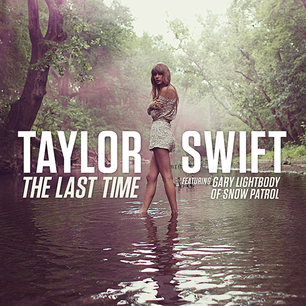 "The Last Time" officially impacted UK contemporary hit radio on November 4, 2013. Joseph Atilano of The Philippine Inquirer described "The Last Time" as the most mature track on the album and positively noted that it "represents a darker tone" on "RED". He further commented that the song "proves she is ready for the adult-pop realm" and lends her artistic credibility. "Holy Ground" is a song about moving on from a failed past relationship and maturing from it. The title is a reference to a “safe” place, kind of like a truce. The song was written by Taylor. It is the first and only one of her songs that Jeff Bhasker has produced. When she started writing the song, she knew she wanted Bhasker to produce the track. Taylor contacted him and he agreed to work with her. As a result, “Holy Ground” sounds different from any of Taylor’s previous work. She explained the song’s meaning in an interview. The song was generally well-received, with some critics highlighting it as a stand-out track. It was also a fan favorite from the album, many of them hoping that "Holy Ground" would eventually be made a single -- which it wasn't. Taylor has said that she only recorded the song once because the first take captured the emotion she felt while writing the song perfectly. She also didn't want to add too much production to the track in order to keep the listener's focus on the lyrics. "The Lucky One" is a song about a star who had it all -- and who was also exposed to all the tabloids, lights, and cameras. After her secrets were being leaked all over the world she was done and moved away to a life of solitude. Nobody knew where she had gone. Taylor wrote this song in Australia, and although she doesn’t say who the song is about (she set a rule against this herself), the song is rumored to be about Joni Mitchell and Kim Wilde. The lyrics, “They say you bought a bunch of land somewhere, chose the rose garden over Madison Square” could possibly be referencing how Wilde left her career to become a landscape gardener. The main melody is also sampled from Wilde’s “Four Letter Word”. The song ends with Taylor understanding why the star chose that path, and how Taylor feels that she’s becoming the “The Lucky One”. 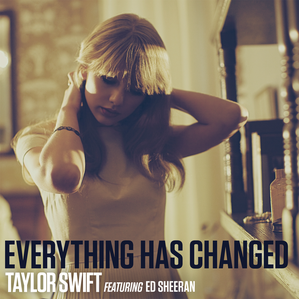 “Everything Has Changed” is a song about realizing your life has flipped upside down after falling for someone new. It was co-written by Taylor and her close friend Ed Sheeran. Ed Sheeran is one of several songwriters that Taylor reached out to write with her on "RED". She told Billboard that the people she chose to collaborate with were ones who inspired her. Ed said their partnership worked since they have a lot in common. "Everything Has Changed" peaked at number 32 on the US Billboard Hot 100 and entered the top ten charts of countries including Belgium, Ireland and the United Kingdom. The music video for the song follows a day in the life of two young children in the same elementary school class. They are both misfits and become good friends, but their platonic feelings turn to something more. At the end of the video, it is revealed that the girl is Taylor’s daughter and the boy is Ed’s son. The duo also performed the track every night on Taylor's "RED Tour". "Starlight" finds Taylor singing about the romantic adventures of Ethel and Bobby Kennedy after coming across a photo of the pair dancing when they were teenagers. The song was co-produced by regular collaborator Nathan Chapman and Dann Huff and written by Taylor. Ethel and Bobby are the grandparents of Conor Kennedy, whom Taylor was dating while writing for "RED". 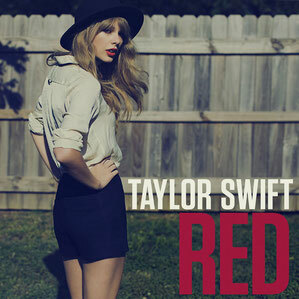 "Begin Again" is the album closer of the standard edition of "RED". 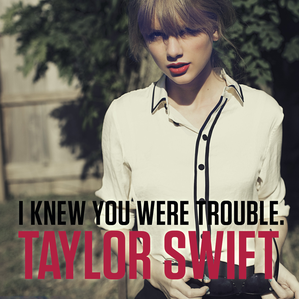 It is a country ballad, with the lyrical content finding Taylor falling in love again after a failed relationship. The song was written by Taylor and produced by Dan Huff and Nathan Chapman. The song was widely acclaimed by music critics, many of whom praised Taylor's songwriting and complimented for coming back to her country roots for the close of the album. The song's accompanying music video was shot in Paris, France, and was directed by Philip Andelman, who also directed the music video Taylor's "Safe & Sound". "Begin Again" generally was commercially successful, and it became her second top ten hit from "RED" on both US and Canadian charts following the hit single "We Are Never Ever Getting Back Together", debuting and peaking at number seven and four respectively. 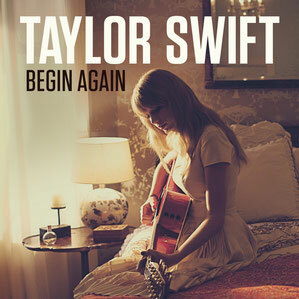 "Begin Again" was nominated for the Grammy Award for "Best Country Song" at the 56th Grammy Awards. “The Moment I Knew” is a song that tells the true story of how Taylor’s then-boyfriend, Jake Gyllenhaal, didn’t show up to her 21st birthday party. 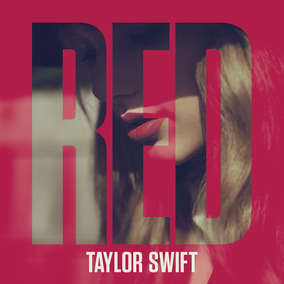 It only appears Deluxe Edition of "RED". Taylor has never performed the song live. On “Come Back…Be Here”, Taylor sings about a lover lost to distance and time over a simple production reminiscent of her "Speak Now" days. 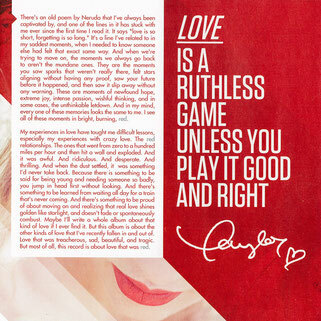 The song appears on the Deluxe Edition of "RED". The song is a fan favorite, as it is Taylor's only "long distance relationship" song. After being asked to perfom the song for years and years, Taylor finally sang "Come Back...Be Here" live in Toronto on August 5, 2018, on her "reputation Stadium Tour". The song was written by Taylor and produced by Nathan Chapman. Taylor talked to Yahoo about the song. A few years after its release, Taylor isn't particularly proud of the song anymore (similar cases would be "Picture to Burn" and "Better Than Revenge"). She is reluctant to perform "Girl At Home" live.